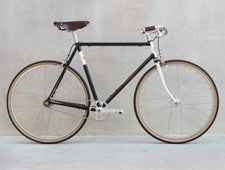 A great bike for those who want to commute or just get around the urban streets in style. The frame that started it all is a no nonsense, nothing extra, bike for coffee and pub runs. The 650B wheel size puts the rider closer to the road and the geometry allows for a very low travel speed. 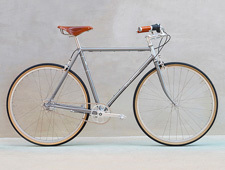 With a 5-speed hub, this bike is great for tooling around the city even when a few hills are thrown in. An inscription of William Carlos William’s “The Red Wheelbarrow” was painted on the down tube for a true custom feel.